When France left the EFA (European Fighter Aircraft) / Eurofighter project in 1985, Dassault was nearing completion of its own advanced combat aircraft program. The aircraft's first flight was on July 4, 1986. Since then 212 Rafale aircraft have been ordered by the Armée de l'Air (40% being two-seaters for training and nuclear strike mission) and 60 have been ordered by the Aéronavale Francaise. The Rafale is slated to become the sole type of combat aircraft operated by the Armée de l'Air and Aéronavale and to be the French armed forces' combat aircraft until 2040, at least. India has selected the Rafale (originally 126 on paper but reduced to a firm 36), Egypt will purchase 24 aircraft, and Qatar will purchase 36. Notes: Update for FSX/P3Dv3. Complete package based on Cyril Pioffet original. Standard and wide screen panel options. Notes: For FS2004. Textures for the AI Rafale by Nick Black/MAIW. Notes: Textures only. Requires the Rafale M and v2.2 Update below by Bruno Mérelle. Notes: Converted models and textures for the MAIW packages in FSX and P3Dv4. Notes: Textures only for the Rafale C/M by Roland Laborie. Aircraft: Rafale C n°102, ECE 1/30 'Côte d'Argent', special decoration commemorating the 100th Anniversary of the aces of the First World War. Notes: For FS2004/FSX. Three texture sets for the AI Rafale by Nick Black/MAIW. Notes: For FS2004/FSX. Textures only for the AI Rafale by Nick Black/MAIW. Notes: For FS2004/FSX. Fictional texture scheme. Complete repackage of Rafale by Cyril Pioffet. Notes: Textures only for the AI Rafale by Nick Black/MAIW. Notes: Five colorful fictitional textures for the Rafale C by Cyril Pioffet. For FS2004/FSX. Notes: Bonus Rafale B and Rafale C textures in IAF collection. Textures only for the AI Rafale by Nick Black/MAIW. Notes: Textures only (no readme file and jpeg format needs to be converted to bmp) for use with AI Rafale by Nick Black/MAIW. Notes: Textures only (no readme file) for use with AI Rafale by Nick Black/MAIW. Notes: Complete aircraft with updated flight dynamics, updates to original panel, added optional carrier operations flights. Notes: Complete aircraft with updated flight dynamics, updates to original panel, added optional second panel, and includes carrier operations tutorial. Notes: Complete package of Rafale C by Cyril Pioffet. Flares, smoke, upgraded AB and some panel updates. For FS2004/FSX. Notes: Requires Rafale M below by Thor's Hammer. Tail textures are reversed and on the wrong sides -- My Quick Fix. Notes: Textures for the Rafale C/M by Roland Laborie. Notes: Three set of textures for the Rafale C/M by Roland Laborie. Notes: Textures only for the Rafale C/M by Roland Laborie. Three texture sets for the next Rafale squadron to be activated: EC 3/2 'Alsace' at Mont de Marsan (BA 118). Notes: Textures only for the Rafale C/M by Roland Laborie. These depict the latest Rafale delivered to the French Air Force by the end of September 2013; serial 144. Notes: Textures only for the Rafale C/M by Roland Laborie. Four texture sets, one of each SPA (15, 91, 162) and one from the ET 02.092 'Aquitaine' training squadron. Aircraft: Rafale C, EC 1/7 'Provence', SPA 162 "Tigre"
Notes: Textures only for the Rafale C/M by Roland Laborie. Based at Al Dhafra Air Base, United Arab Emirates. Notes: Textures for two aircraft (low-viz and high-viz). for the Rafale C/M by Roland Laborie. Based at Mont-de-Marsan BA. Notes: Textures for three aircraft. for the Rafale C/M by Roland Laborie. Based at BAN Landivisiau. Notes: Payware for FSX Acceleration. Textures for C and M versions with clean and armed models. Detailed Virtual Cockpit (no 2D panel). FSX Carrier Operations update. Notes: Additionnal views (camera definitions) for the Rafale M package by Bruno "Thor's Hammer" Mérelle. Notes: Additionnal views (camera definitions) for the FSX updated repackage by Anthony Douglas and Vladyslav Pavlyuk of the Cyril 'Gator' Pioffet FS9 Rafale. Notes: Designed for FS2004. 18 external configurations, 13 texture sets in four packs (first required at minimum). Requires previous Rafale C for sound and effects. Notes: For FS2004. Incomplete repackage of Cyril Pioffet Rafale using only Rafale C. Needs panel and sounds from original. Notes: Textures only. Requires Rafale M below by Thor's Hammer. Notes: Designed for FS2004. Four external configurations, four texture sets. Virtual cockpit and 2D panel. Easy engine startup option. See this Preview Page. Notes: For FS2004. Complete package using existing updates and fixes. Include new 2D panel and two new texture schemes. Notes: Textures only. Requires Rafale M and v2.2 Update below by Thor's Hammer. Notes: For FSX Acceleration. An external model/texture update including changes to the texture mapping to help repainters -- this may adversely effect already released repaints. Check for updates by repaint artists. 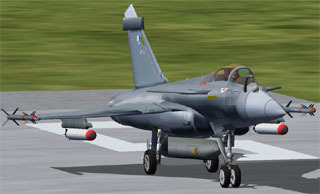 Aircraft: Rafale M, two fictional schemes: "Sand" (left) and "Tan Splinter"
Notes: Two textures sets. Requires Rafale M below by Thor's Hammer. Notes: Textures only. Requires Rafale C/M by Roland Laborie. Install notes/files added. Notes: For FSX. Optional afterburner effect and adjustments for greater stability when landing on moving carriers. Requires Rafale by Roland Laborie. Notes: For FSX Acceleration. Includes multiple weapons loads. Very detailed Virtual Cockpit. See this Preview Page. Notes: For FS2004. Based on AI model in package but is flyable for multiplayer and Recorder flights. No panel or VC. Included in MAIW Rafale scenery/AI aircraft package. Notes: Additionnal camera definition views for the FSX updated Rafale package. Seven cameras pointing at the aircraft, two chase views, and one "afterburner" view. Notes: For FS9. Updated flight dynamics, contact points, afterburner effects, tailhook code, and more. Requires Rafale by Cyril "Gator" Pioffet. Notes: Ported to FSX. Some 2D panel and HUD updates. Complete package. Watch YouTube Video. Notes: Textures only. Requires Rafale M by Cyril "Gator" Pioffet. Notes: Ported to FSX. Some panel and HUD updates. Complete package. Notes: New effects for nav, beacon, and strobe lights. Also revised cockpit texture for new blue canopy glass color. Notes: For FS2004/FSX. Part of Carrier Strike Force payware package. Includes virtual cockpit and 2D panel. Notes: Instructions for improved automatic afterburner effect, wingtip contrail during turns, and engine smoke. See "Instructions.txt" for for required downloads. Notes: Ported to FSX. New effects, panel and HUD updates. Seven texture sets bundled. Complete package. Notes: Textures only. Two aircraft from 12F Flotille in low-visiblility gray scheme. Requires Rafale M by Cyril "Gator" Pioffet. Rafale C, EC 05.330 "Cote d´Argent"
Rafale C, EC 01.007 "Provence"
Notes: MDL files only for use with multi-user IBNET. All textures below for Rafale by Cyril "Gator" Pioffet will work. For more information on IBNET visit IBirdSoft and PAF Virtuelle. Notes: Textures only. Two versions of black Rafale: with and without logo on tail. Requires Rafale C by Cyril "Gator" Pioffet. Aircraft: Rafale C, Armée de l'Air, EC 1/2 "Cigognes"
Notes: Textures only. Requires Rafale C by Cyril "Gator" Pioffet. Notes: 5 aircraft, textures only. Designed for the Rafale by Cyril "Gator" Pioffet. Notes: Textures only. Designed for Rafale M by Cyril "Gator" Pioffet. Notes: Textures only. Designed for Rafale by Cyril "Gator" Pioffet. Notes: Camouflage scheme. Designed for the Rafale by Cyril "Gator" Pioffet. FS Version: CFS2 Recommended sound and panel by Oxyd. FS Version: Designed for CFS2. Recommended sound and panel by Oxyd. FS Version: RAFALE_M.ZIP repainted and converted from CFS2 to FS2002. FS Version: CFS2 only. Requires RAFALE_M.ZIP below. A multi-resolution model for improved frame rate and smoother animations. FS Version: CFS2 only. Requires RAFALE_M.ZIP below. Adds a detailed working virtual cockpit including animations and night effects. FS Version: CFS2 only. Requires RAFALE_M.ZIP below. Updated weapons pack adds MU-90 torpedos and centerline drop tank. New dp and .air file included. FS Version: CFS2 only. Requires RAFALE_M.ZIP below. Better 3D cockpit, good positioning of the arresting hook (not animated though). FS Version: CFS2 only. Requires RAFALE_M.ZIP below. New mdl adds spinning wheels to the model. Notes: CFS2 only. Original DP file and weapons pack. True CFS2 .air file (including afterburners) and animation. Notes: An update of Oxyd's Rafale M converting it for use with CFS2. Requires RAFMMDL.ZIP below. Notes: Separate sound and panel.